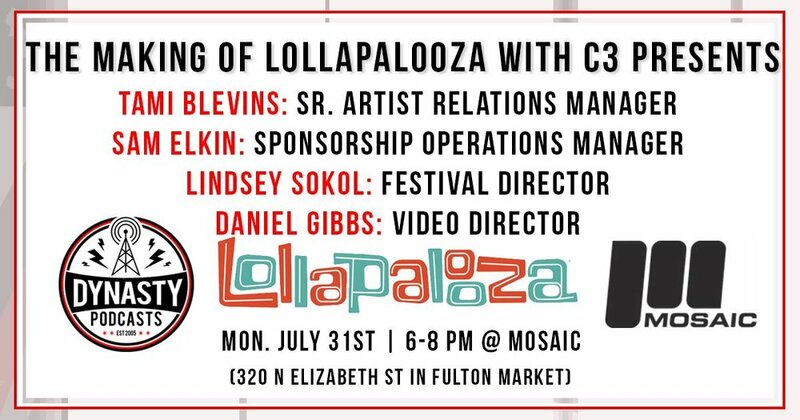 In a live panel recorded at the offices of experiential marketing agency Mosaic in Chicago's Fulton Market neighborhood, representatives from live music production powerhouse C3 Presents join Dynasty Podcasts for a discussion on the creation of the annual Lollapalooza festival. Featuring Senior Artist Relations Manager Tami Blevins, Sponsorship Operations Manager Sam Elkin, Festival Director Lindsey Sokol, and Video Director Daniel Gibbs. The panelists speak on all aspects of activating Lollapalooza, from managing talent to securing permits, and everything in between. The speakers also weigh in on what keeps audiences coming back to Lollapalooza, with 100,000 people attending each day over four days.